Dinosaurs on a golf course? 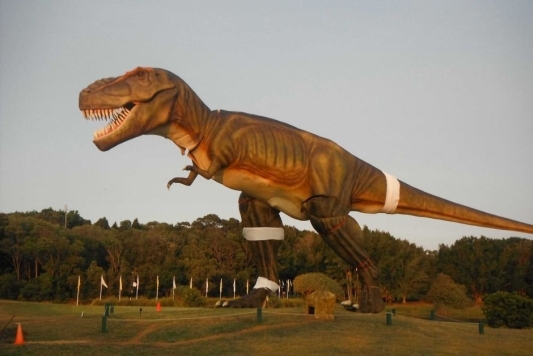 I’d been avoiding the ‘Dinosaurs at Coolum’ story for a while now as I just wasn’t sure whether it was a hoax. Now I’m sure it isn’t, it’s hard to avoid for the sheer lunacy of it. There were plenty of takes on Adam Scott’s win at Kingston Heath last week, but I particularly Richard Hinds’ amusing piece. Ben Everill chatted to Geoff Ogilvy ahead of his appearances at The Australian Open and Australian PGa Championship in December. He’s fired his caddy of 13 years and looking to Adam Scott for inspiration. “I feel I’m at the point where I’m probably closer to the end of my career then the start,” said Ogilvy. “There’s some stuff I want to achieve that I haven’t done yet and I don’t want to be looking back in five or six years thinking ‘what if?’. Mark Hayes at The Herald-Sun wrote a passionate piece calling on Australian golf to pool all its resources into hosting one big, lucrative tournament every year. “Ask yourself how many horse races stop the nation. Then ask how many times we go for a spin around Mt Panorama each year. Not coincidentally, that’s the number of golf tournaments we ALL know from Britain each year. It’s the number of times Australia is glued to a tennis tournament. The Australian’s Brent Read (digital pass needed) thought that Clive Palmer could be the knight in shining armour that Australian golf needs, although it’s hard to agree when we’ve now seen what he’s keen to bring to Australian golf course. and finally, Luke Elvy gaves us his thoughts on his interview with Jarrod Lyle last week. “It was the first time he’d faced the media since doctors discovered Acute Myeloid Leukaemia had returned for the second time. It wasn’t to tell us he’s out of the woods, he’s far from it, more to explain the living hell his life had become since early March.